The blue sky gear Tuff Ware Spork 1.0 Is the perfect camping utensil. 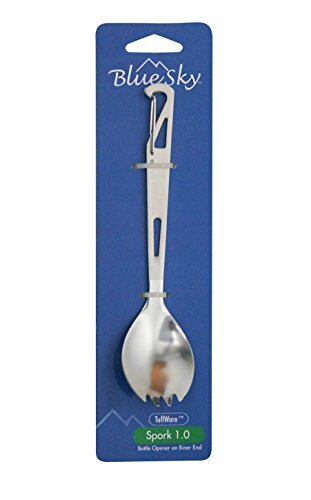 Constructed of corrosion resistant stainless steel, the Spork 1.0 Gives you the best of both worlds; a spoon and a fork combined into one perfect sized, easy-to-use utensil. This lightweight and durable utensil has a bottle opener on the binder end which clips easily to your gear or backpack. The Spork 1.0 Is a must have for your next camping adventure.